Educator, minister, & orator for Patriot cause. His "Log College," a classical academy, stood 2 1/2 miles northwest. 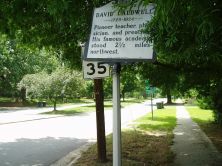 Minister, educator, patriot David Caldwell (1725-1824) was one of North Carolina’s towering figures during the Revolutionary and Federal periods. Throughout a life spanning almost a century, Caldwell dedicated himself to his religion and his country, He took an active role in organizing Presbyterian congregations and leading his community through two wars against Britain. Born on March 22, 1724 to Andrew and Martha Caldwell, David Caldwell and his three younger brothers spent their childhood on the family farm in Lancaster, Pennsylvania. After practicing carpentry until he was twenty-five, David was so compelled to enter seminary that he agreed to waive his right to the family inheritance if his brothers would assist with tuition for the College of New Jersey at Princeton. After graduating in 1761, he remained at Princeton long enough to receive a Presbyterian commission two years later. After becoming an ordained minister, Caldwell was tasked with organizing congregations in North Carolina. In 1766 he married Rachel Craighead, daughter of prominent minister Alexander Craighead and assumed leadership of Alamance and Buffalo congregations near modern Greensboro two years later. 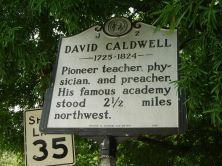 In addition to religious duties, Caldwell operated a classical academy with up to sixty pupils annually. He also became a self-taught physician. His fees were inadequate to provide for his family of nine, even when supplemented with his ministerial stipend. Therefore, he turned to agriculture, where he characteristically found success. Caldwell was crucial to North Carolina’s war efforts in the late eighteenth and early nineteenth centuries. An excellent orator, he advanced the Patriot cause from the pulpit. So influential was Caldwell that, according to biographer Eli Carruthers, both of his congregations volunteered to the last able man. During the War of 1812, recruiters asked a frail Caldwell to boost patriotism among his flock. Caldwell delivered a stirring invocation, forcing recruiters to choose from droves of volunteers. After a lifetime of dedicated service to country and community, Caldwell died on August 25, 1824, less than a year from his centennial. He is buried at Buffalo Church in Greensboro.